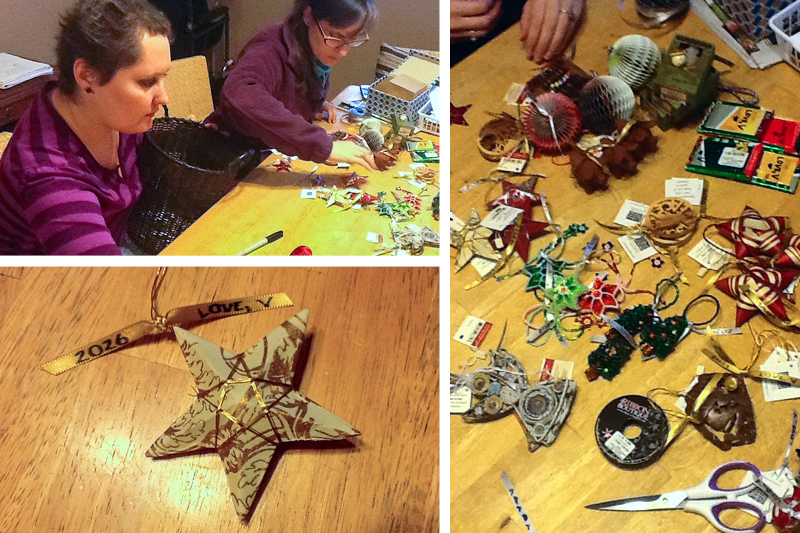 You may remember from Billy’s guest post how he and V went to Ten Thousand Villages and bought 21 years worth of Christmas ornaments to give to Max, Myles & Leo. That’s 63 ornaments! One of the Ten Thousand Villages ornaments V bought for the boys, handcrafted in Nepal. How cute is this guy, seriously!! If I remember right, I think it’s on the docket for 2013 or 2014. First off came The Great Ornament Purchase, where Billy and Vanessa spent hours at Ten Thousand Villages picking out all of the ornaments, even cozying up to the saleswoman and getting a special early go at the inventory in the back. A few days later, Jess, Vanessa and I carefully decided which ornaments would go with which years — the smells-like-cinnamon one first (lest it lose its delicious scent before it got opened! 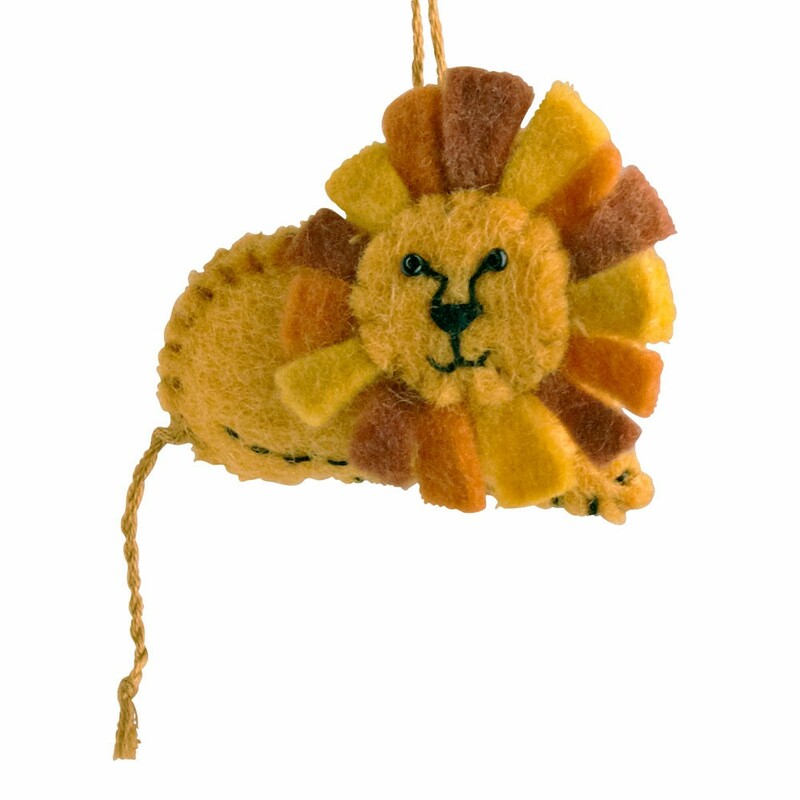 ), then soft and colorful ornaments for the early years, and then the more delicate ones for when the boys are a bit bigger. Vanessa tied gold and silver ribbons on each one with “LOVE V” and the corresponding year written in Sharpie. I was struck by so many things during these lovely afternoons. How Vanessa’s handwriting again looks like it did in 1992. How deliberately she wrote “LOVE V” on every ribbon and every label. How “2032” looks like a made up number, not a year. How nobody knows anything about where they’ll be in 2032. What will that Christmas look like? Will it snow? Who will be there? Who won’t be there? Vanessa doesn’t ask these sorts of questions much these days. She’s very focused on the NOW, on the project in front of her, on whatever is in her hand at the moment. But I am grateful for the legacy she is already leaving us, the one that prior versions of herself came up with and that the current version carefully contributes to, even if not entirely remembering why she’s doing it. I know if I ever have kids (and again, who ever knows?) I will buy them handmade ornaments and sign them LOVE V and give my children a gift from my sister, through me. And I was struck by how great of a choice Ten Thousand Villages was — a company that helps communities across the world live sincerely. How many hands from so many countries made these little ornaments that we attach our own meaning to. Because look at these women! 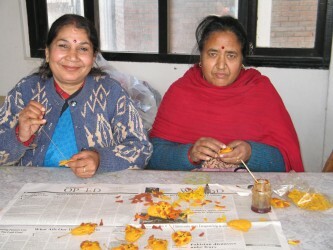 They are part of the Association for Craft Producers in Nepal, and they are creating the little lions that Billy helped V pick out, that made me and Jess go “AWWWWW!”, and that Mom helped pack up and wrap for a future Christmas. These women are sitting together at a table in the sunlight creating something meaningful, just as I sat with my family at a table in the sunlight helping their creations find a home. These women and the stories behind their stitches will be part of the Yaeger family Christmas tree just as much as Vanessa and the stories behind her handwriting will be. I am so humbled by these stories and the way they weave through each of us. Beautiful!Inspires me to do something like this. I find it poignant that this disease has given Vanessa one gift: being in the moment. It is so hard for many of us. God bless you all for giving her so many wonderful moments. And it’s so true that often our ability to live presently (as well as sincerely) is awakened by tragedy and challenge. Mine came after my son’s sudden death – when I discovered that only in Now, in This Moment, was life bearable. As always, I hold you all in the heart of my heart. We spend time learning to suppress feelings that we think are inappropriately displayed, and count it a mark of good taste to be composed at all times, outwardly carrying on in the normal behaviors. When the heart is suddenly “busted” by unexpected fear, loss or deep grieving, it opens up a door to being human, that will not be closed or locked again. Through this doorway, feelings pass in and out; emotions are allowed to enter, leave their grievances, and pass out the same door. All the training and practice and learning to disguise or hide genuine emotions no longer works. When life sends its sudden news that the irrevocable is here, nothing we can do to change, something must unlock and/or unblock the barrier that has prevented familiarity and intimate sharing. When this is done, we are not only able, but always strive to place ourselves in the situation of another person, and connect. Loss, death, and troubles are only a few events that arrive with a key to the heart’s door. If we could totally understand this, we would say “Thank You” for everything that happens. Pure sweetness and joy in a bittersweet kind of way. All I can say is “wow”. V, you have definitely put a new face on the phrase, “keep on keeping on.” God bless you. How beautiful. I just love what Vanessa is doing. She is an inspiration to me and so many others. Thanks for sharing this with us Joules and helping her leave such an incredible legacy. V~ I am beyond blessed by our friendship!!!! When I think that I am having a bad day….. I think about living sincerely. Thank you for giving me this beautiful gift. I love you V!! V is such an amazing, caring, giving woman. Always thinking of someone else, so selfless, so much love. The ornaments represent her forever promise to live sincerely and forever in her family’s hearts forever. What a wonderful idea…forever sharing her love of the boys and life forever. I,too, have advanced breast cancer and words just cannot expressed how much V and your family sharing your journeys have touched me so deeply and helped me so. I read V’s journey in one day as I just came across it recently. Ever since then, I think of Vanessa each and every day, and every day I continue to pray that she is not in terrible pain and that her happy spirits are continuing…. I’m very grateful and so proud of all of you! How is V and how is your special family doing today? I love V#1 through V to infinity – forever an angel… Thank you.